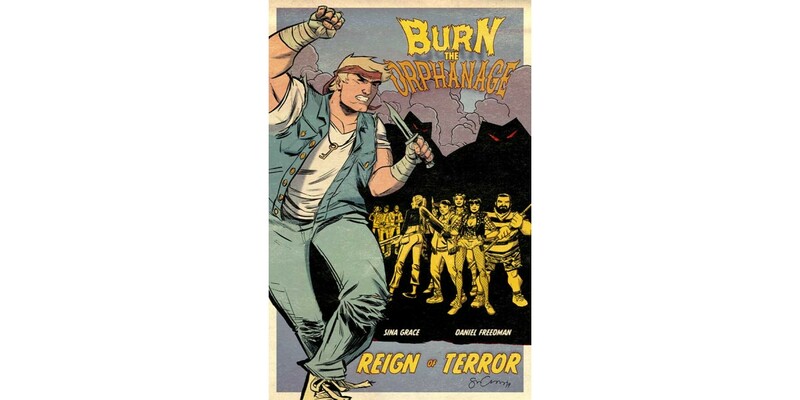 Image Comics creator Sina Grace has teamed up with The Lustgarten Foundation to donate all 20 pages of art from BURN THE ORPHANAGE: REIGN OF TERROR #1 to support pancreatic cancer research. The series of auctions, titled Compassion vs. Cancer, will go entirely to The Lustgarten Foundation’s efforts in raising awareness for the under-funded and highly-deadly cancer. With only a 6% survival rate, pancreatic cancer is a lethal type of cancer that affects an average of one in 68 people. No stranger to the loss of friends and family from both cancer in general and pancreatic cancer, Grace sought out the Lustgarten Foundation to brainstorm ways to make a dent in the fight against cancer. The auctions all start between $10 and $25, allowing fans of all income brackets a chance to participate. All proceeds from the auctions will go to the Lustgarten Foundation to fund and support research into the biological mechanisms and clinical strategies related to the prevention, diagnosis and treatment of pancreatic cancer, as well as facilitating dialogue and public awareness for pancreatic cancer patients, their families, and friends. BURN THE ORPHANAGE is a video game-loving action series from Sina Grace (SELF-OBSESSED, LI'L DEPRESSED BOY, NOT MY BAG) and Daniel Freedman (UNDYING LOVE, STIMULUS). Issue #1 of the REIGN OF TERROR story arc debuted today, showing the team of heroes in peril against a corporation that has taken the city under siege. To place your bid, please visit: http://www.compassionvscancer.com to view all of the auctions, which will remain open until May 17th. To learn more about The Lustgarten Foundation and how 100% of donations go to research, please visit www.lustgarten.org. Sina Grace is the author and illustrator of the autobiographical SELF-OBSESSED and NOT MY BAG, which recounts a story of retail hell. He acts as the artist for S. Steven Struble's cult hit, THE LI'L DEPRESSED BOY, and handles art chores along with co-writing the Image Comics hit series, BURN THE ORPHANAGE. He lives in Los Angeles, where he can be found in coffee shops working on whatever the next thing may be. www.sinagrace.com, follow @SinaGrace on all social media.